GBA Super Monkey Ball Jr. (USA) "Master" in 01:49.31 by TASeditor. 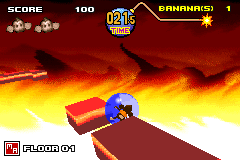 In Super Monkey Ball Jr., like in the other Super Monkey Ball movies, you must guide a monkey trapped inside a transparent ball by tilting the game world across several floors. However, due to the GBA not having analog controls, it is noticeably more difficult to guide the monkey to the goal. TASeditor improves the previous run through the Master stages by 2.79 seconds, thanks to better optimization.